ELTON John cradles Zachary Jackson Levon in his arms and the years of waiting for an OK! magazine baby montage are finally at an end. Elton says the inspiration for having a baby of their own was their failed bid to adopt Ukrainian orphans Lev and his brother Artyom. So, surrogacy it was. 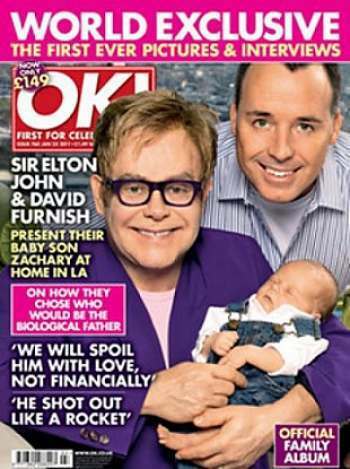 Elton and David Furnish looked through a selection of “egg donor profiles”. A woman was chosen whose skin tones would set off Elton’s red robe he sports for the shoot and David’s dancing eyes.? And they had to select a surrogate. She is “very knowledgeable about natural, organic products for children, the types of nappies to use, ways to feed the baby”. She’s a rare find in a Californian woman. Elton and David got to know the surrogate via the phone. They used pseudonyms when talking with her. We’re not told that they were but Beckham and Cruise would have excited any fallopian tube. But before long the woman started to wonder and then she “cracked it”. Then David began to meet with her regularly. And he began to swot up on fatherhood. He did as any prospective dad must: he hired a nanny. He went shopping in Pottery Barn Kids. He bought a feeding chair, a changing table and a bassinet. He had them wrapped in Christmas paper to keep it all secret. He bought a car seat. Then on Christmas Day, the child was born. David’s swatting stood him in good stead. But God did not answer. Not yet. They are keeping a scrapbook of Zac’s life, including his surrogate, his donor and his dads. And who is the daddy?